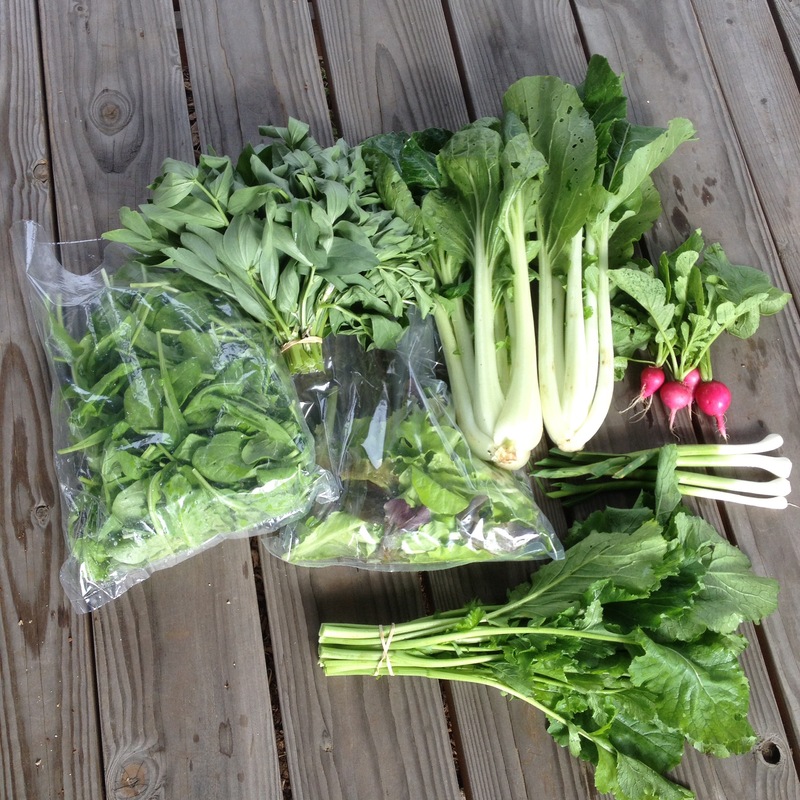 The first CSA shares are out the “door” for 2016! Welcome to all of our new members this year, and welcome back to all the returning folks. This blog is where you’ll find out what’s in your share, and perhaps some tips on using those items. It’s been quite a spring with many hot, hot days but also a decent amount of rain, which has made some of our spring crops mature bigger and earlier than usual. Also the slugs are back at their tricks with this moisture, so please excuse their little holes. Fava shoots – this is probably the item people are the most unfamiliar with from this week. They are the top leaves and stems of the fava plant. They can be eaten raw or cooked (stem and all). Chop them raw into a salad or as garnish on a soup. Saute them with olive oil and salt as a side dish. Bok choi – Nice big heads today. Steam, saute, stir fry? If you’re at a loss with greenery, you can always stick it in a smoothie! “Pink beauty” radishes – just a few of these and hopefully there will be more for Thursday folks. By the way, the greens are edible as well — cook them just a little to wilt them and make them less fuzzy/furry. Green garlic – This softneck garlic has not made bulbs yet so the whole stalk is edible. You’ll probably notice a little garlic rust so trim that out as you prep it. It has a milder flavor than cured, mature garlic, so don’t be afraid to use a lot. Some folks like to use green garlic to make pesto. You could probably make pesto with the fava shoots for an interesting flavor combo. Spring Raab – aka “broccoli raab” – many of these don’t actually have the “raab” or “rapini” part developed yet (the flower bud cluster), but the leaves and stems are delicious just the same. One way to cook them is in the oven with olive oil/salt – try ~400F for about 20 minutes, tossing once at halftime. Let the leaves blacken a little and the stems should be soft. Arugula – A nice big bag of salad quality arugula! Eat it on everything from sandwiches to eggs! Lettuce mix – A smaller bag of cut mixed lettuce greens. That is all for it’s been a long day. I’m so grateful to the awesome farm crew this year. Martin and Josh are rockstars. Please say hello if you see them at the farm.